Remodeling and landscaping projects can leave you with a lot of junk and debris to clean up. That’s where we come in! At Dumpster Chumpster, we provide dependable junk removal in in Arcadia, and we can help you get rid of your items quickly and easily. For all of your junk removal services large and small, give us a call! We’re more than happy to figure out a solution for your needs. Our premier hauling service for helping you get rid of your junk is an easy, convenient way to get things done. Say you’re only doing light demolition and won’t need a full-sized dumpster for days or weeks. Why go through the hassle of renting one or waiting for scheduled pickup times? Our load-and-go service offers a solution to these problems. We’ll bring you the dumpster for a period of about two hours at a time. During this time, you can load as much or as little as you want! We’re happy to let you load up anything you want to be hauled away. A junk remover from our team will wait with the truck, ready to haul it away when you’re finished. After we haul away the junk and debris, you’ll have nothing else to worry about! This service is helpful when your schedule is busy or you don’t want to rent a whole dumpster for just a few branches and brush. There’s no need to hold out for a scheduled pickup or to hold onto a dumpster any longer than you need to. That’s why so many customers love our load-and-go service. Great for Renovation and Demolition Work! Renovating a small portion of the house? This is also where our load-and-go junk hauling services come in handy! We can take extra lumber and debris off your hands for a reasonable price and without any additional hassle. So when you need to get rid of a few things and don’t want to have a dumpster on your front lawn for days or weeks, call Dumpster Chumpster! We’re the local junk hauling business you can trust. 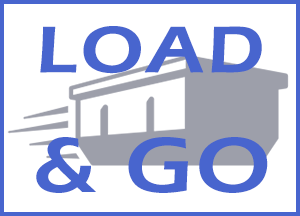 Chat with us about your needs and inquire about our load-and-go junk hauling service for the Acadia area. We can’t wait to work with you!